Kozlowski in 2005 after being found guilty. 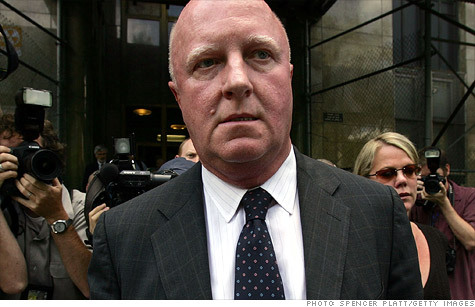 NEW YORK (CNNMoney) -- Former Tyco executive Dennis Kozlowski was denied parole Thursday, according to a spokesman for the New York State Department of Corrections. The fallen CEO was sentenced to 8-1/3 to 25 years in prison in 2005 for his part in stealing hundreds of millions of dollars from the manufacturing conglomerate (TYC). A three-member parole board denied Kozlowski after a hearing held Wednesday, despite a clean disciplinary record and what the board called "progress and achievement" while incarcerated. Kozlowski was informed of the decision Thursday. "Your discretionary release, at this time," the decision said, would not be "compatible with the welfare of society at large, and would tend to deprecate the seriousness" of the offenses and "undermine respect for the law." Kozlowski will next be eligible for parole in late 2013. The parole ruling says Kozlowski is being held at the Lincoln Correctional Facility, a minimum security jail for males in Harlem -- just north of Central Park in Manhattan. Kozlowski was previously held at Mid-State Correctional Facility in Marcy, New York.